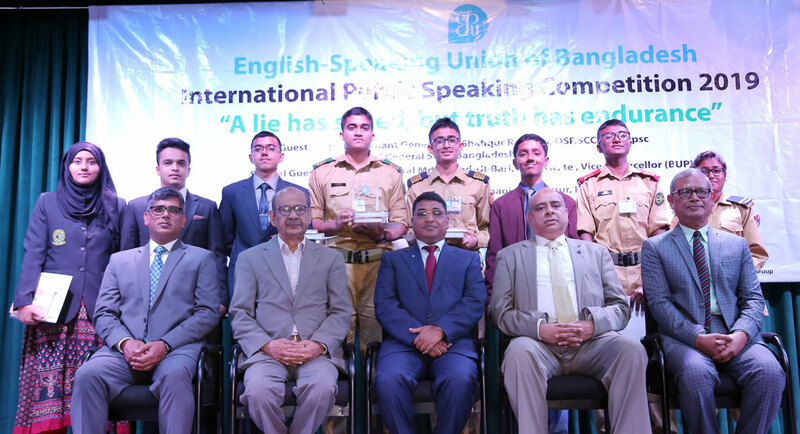 First Security Islami Bank sponsored International Public Speaking Competition (IPSC)-2019 held at Bangladesh University of Professionals on March 02, 2019. The champion of the competition was Sajid Bin Mahamud from Mirzapur Cadet College and runner-up was Farhan Istesham from Faujdarhat Cadet College. Lieutenant General Md. Shafiqur Rahman, OSP, SCC, afwc, psc, Chief of the General Staff, Bangladesh Army was present as Chief Guest. Mr. Syed Waseque Md. Ali, Managing Director, First Security Islami Bank Limited and Major General Md Emdad-Ul-Bari, ndc, psc, te, Vice-Chancellor of Bangladesh University of Professionals were present as special guest in the program. Among others, Mr. Haider Rezvi, Acting Chairman and Major General Jiban Kanai Das (Retd. ), Secretary General, English Speaking Union of Bangladesh were also present on the occasion.